This is the cream can tutorial that I put up for March, the previous post. 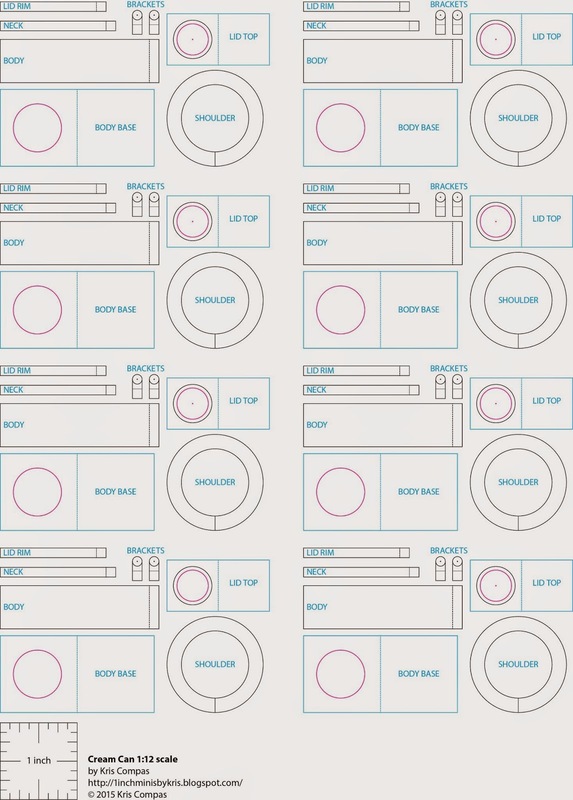 Nancy sent us a whole set of cream can patterns to make use of a full sheet of card stock, too cool for school! We can set up an assembly line for sure. So nice, thank you, Nancy. 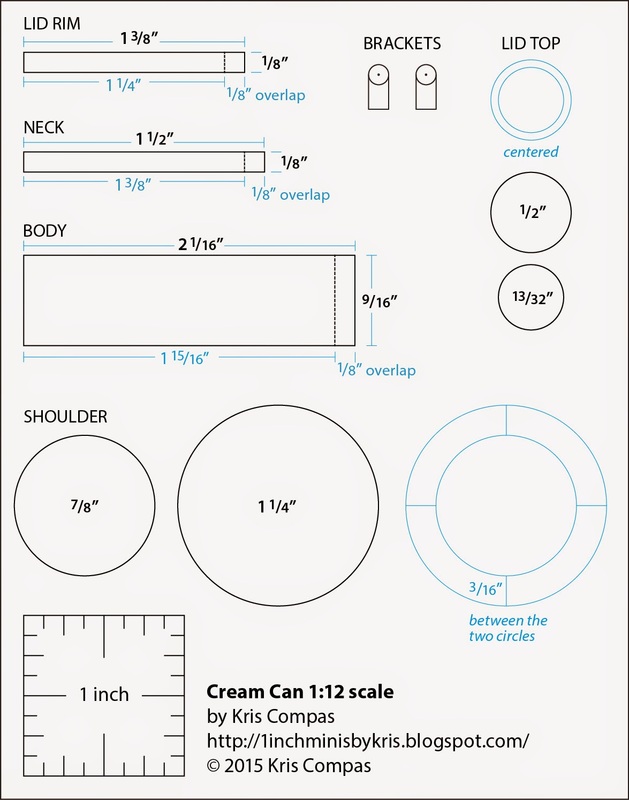 1 INCH SCALE CREAM CAN - How to make a 1 inch scale cream can from card stock. I was walking through Hobby Lobby looking at all of the cool decor items and saw some tin items I really liked. One of them was this little cream can. You can put any finish on it you like, I've put a galvanized finish on mine. This is the pattern sheet that Nancy made for us. She has shown you all of the dimensions so you could just draw the pattern on your own. If you want to print the pattern out I suggest you print it on card stock so all you have to do is cut the pieces out. One note: we will use the circles printed in blue for the cream can. I like the way she showed you what I did to get the finished pattern piece, don't you? To print this out I have directions in the "Things to do, Things to see" list at the left, "HOW TO RE-SIZE THE PATTERNS". Nancy puts a 1 inch square on the pattern sheet so you can align the rulers to it, if the square measures 1 inch you have the right size pattern. Another note: You could change the size of this pattern to suit your needs, make it bigger or smaller as in maybe a canister set?? Did you see Nancy's logo on the right side of the blog? Click on the picture and if I did things right?? it should take you to her site. In this picture I am showing the difference between sewing thread, that's on the bottom and button hole thread, that's the green thread on the top. I don't care what color you get but we are going to use the button hole thread for this project. Since I decided to make my cream can have a galvanized finish I mixed up half and half yellow glue and silver paint to paint the button hole thread for a "rolled edge". This is my thread after the paint mixture has dried. Yes, I am painting the thread the color I need but I am also making the surface smooth. This needs to look like metal, it's the "rolled edge" of the can. If your thread still looks like thread run it through the paint again. I usually dip my fingers in the paint and pull the thread through my fingers. I hang the thread to dry. This is the same for when I ask you to use crochet thread, that's thicker than button hole thread, for a rolled metal edge, if you can see that you've painted thread, re-paint the thread. If you are going to draw the pattern pieces keep your pencil sharp and put a new blade in your craft knife. Cut four squares of card stock, no measurements on this, maybe 1 1/2" x 1 1/2". Using yellow carpenter's glue, glue the pieces together. One set is the bottom of the can and the other set is for the lid. I am using a piece of 5/8" wood dowel for a mould for the body of the cream can. This is important so the the body can retain the shape. Cut your pattern piece out or measure 9/16" wide and 1 15/16" long, then add 1/8" overlap. Wrap the body around the dowel and glue. Make sure the card stock is not glued to the dowel, twist it a bit to make sure. Your end should come to the line. Slide the body down off the dowel a little bit. Apply yellow glue to the edge. Set the body onto one of the card stock squares you glued together earlier. Do Not slide the dowel back down. Keep the dowel out of the glue but still in the body of the can. I used my circle template to create the shoulder of the can. I centered a 7/8" circle in a 1 1/4" circle. That left 3/16" of space between the circles. I've marked the quarters on the pattern piece. If you are using Nancy's pattern sheet cut out the blue patterns for the circles. When I cut out my pattern I left the pencil line on. Cut the circle open on one of the quarter marks and bend the card stock around your finger to get it going round. I've wrapped one end of the circle around to the half-way mark and glued with yellow carpenter's glue. Press to seal. I've applied glue to the rest of the circle and pressed it all together to seal. One end is on the outside and the other end is on the inside. The ends of the circle should match up on either side. You have a doubled layer of card stock, now. Remove the dowel and glue the shoulder to the top of the body. This is the neck. It measures 1/8" wide and 1 3/8" long plus 1/8" overlap. Cut this out and bend it around your finger to get it going round. Glue the neck together with yellow carpenter's glue, overlapping to the line. Apply glue to the edge of the neck and glue to the shoulder of the can. The neck is glued on. This is the beginning of the lid. Use the last set of card stock squares you glued together earlier to draw the circles on. I centered a 1/2" circle over a 13/32" circle. I cut the top of the lid out, I left the pencil line on the outside circle. Cut the lid rim 1/8" wide and 1 1/4" long plus 1/8" overlap. I bent the rim around my finger to get it going round and glued the ends together, overlapping to the line. Glue the rim onto the top on the inner circle line. Cut a strip of card stock 1/16" wide. Wrap the strip around a tooth pick twice and glue together. Don't glue to the tooth pick. Snip off the extra card stock. Glue the circle to the center of the lid, using yellow carpenter's glue. Ideally I would like you to let all of this dry over night so the glue can get good and hard. When the glue has dried, trim off the bottom extra card stock. I have 300 grit sand paper there and I am going to sand all the seams smooth. I am ready to go on. Hold onto your hats I'm using Tacky glue! I have found that Tacky glue is the best for gluing on the "rolled edge" we made from the button hole thread. I've glued the thread onto the very bottom edge and onto the seam where the body and shoulder meet. I want to make a wooden handle for the cream can. This is optional. I am using a tooth pick and files. The files are available from Hobby Builders. My handle is 1/4" long, if I were going to make this again I think I would make the handle 5/16" long. I used a triangular file to make a narrow cut into the wood. This is inside my drawn lines. Then I used an oval shaped file to round over this cut. I am using my craft knife to cut on the drawn lines to cut the handle free from the rest of the tooth pick. Get out a "T" pin. Look at the end of your handle, do you see a little center mark? It's always there when I cut my tooth picks with my craft knife. Carefully stick the point of the "T" pin into the mark on both ends. This hole you have made will be where you will insert the drill bit to drill through the handle. I've shown you my little hand drill with it's drill bits. I bought this from Hobby Builders. It's a good tool to have. Use the smallest or next to the smallest bit to drill through the handle. When I do this kind of drilling I hold the little piece of wood between my finger and thumb. This way I can feel if the drill bit is drilling too close to the outer edge of the wood. I am holding the wooden handle and turning the drill bit, keeping everything straight. I drill for a little while on one end and start to drill from the other end. I go back and forth with this way until I meet in the middle of the handle. I am through the handle. I am using paddle wire for the handle. I find this at Michael's in the floral department. There are two gauges that I have. The one that I am using for this project is the 26 gauge. This wire should fit through the hole you drilled. Can you see that I have rounded off the ends of the handle with sand paper? Cut 2 1/4" of the wire for your handle. You can change this length if you want. Hold onto the wire with pliers and use sand paper to strip off the paint. I have slipped the wooden handle onto the wire. I've got my box of chalks out and I've colored the handle with brown chalk, making sure that the grooves are darkened. I took my wooden handle off the wire, you don't have to, I bent the wire around the 5/8" dowel we used as a mould. The handle is back on. Ignore the cream can you see in the background. I have changed this part from my prototype as you can see from the picture above. The handle was last, after painting. I ran into a problem with my handle not swinging because I bent the wire into an "L" shape and inserted into the brackets and pinched the wire to close. It worked fine the first time but when I tried it again my handle wanted to tear the brackets off. Wrap the very end of the wire around a tooth pick, each end. Your wooden handle is on the wire, my fingers are holding onto it. You can cut out the brackets on the pattern page or draw them as I show you. Use the circle template to draw a small circle, I used 7. I don't know what the whole numbers mean, but in the picture you can see that there is 5,7, 9 and 11, I used 7. I placed a dot in the center. Measure from the bottom of the circle 3/16" and make a mark. I used my square to draw a straight line down from the side of the circle to the 3/16" mark. There is the first line. Continue to use the square to draw lines down to the mark on the other side of this circle and on the other circle. I did not show this but I want you to measure up from the bottom of the bracket 1/8" and make a mark. Before you cut the brackets out use a "T" pin to pierce holes on the marks you make earlier. Open the hook, slightly, and put your brackets on the handle. Close the hook. I made the cream can, made the handle and then couldn't get the handle on because of the way I had made the handle. That's why I am putting the handle on with the brackets attached. Glue the brackets to the body of the cream can with yellow carpenter's glue. Remember the line you added to the brackets? That line goes beneath the button hole thread. We want enough of the bracket left on top for the handle to swing. I use sticky wax on the end of a tooth pick to hold onto the small pieces. For my galvanized finish I paint two coats of grey on the can and lid. Your handle should be on your can. This picture was taken before I figured everything out! I am using an old brush to dab on the silver paint. I dabbed the end of the brush into the silver paint and then I dabbed the brush onto the palette to remove most of the paint. Then I dabbed the brush all over the can and lid. It's all done. If you want you could give it a spray of mat finish. This could be finished with a white enamel look with the "rolled edge" painted black. I made a rusty finish for the tutorial "Rusty Pan of Geraniums", that would be a good look also. I had a little trial and error but I think it turned out all right. I hope you try this out and make some different finishes and sizes. You could leave the brackets and handle off and make a set for the counter top for canisters. Send me your pictures of the finished tutorials. These pictures help others to see what can be done and gives them courage to try. Ask questions, send pictures to camceiling@frontiernet.net. Hope the sun is shining where you are, as always . . .